Yumi Kurosawa performs an original piece at the World Series of Music. 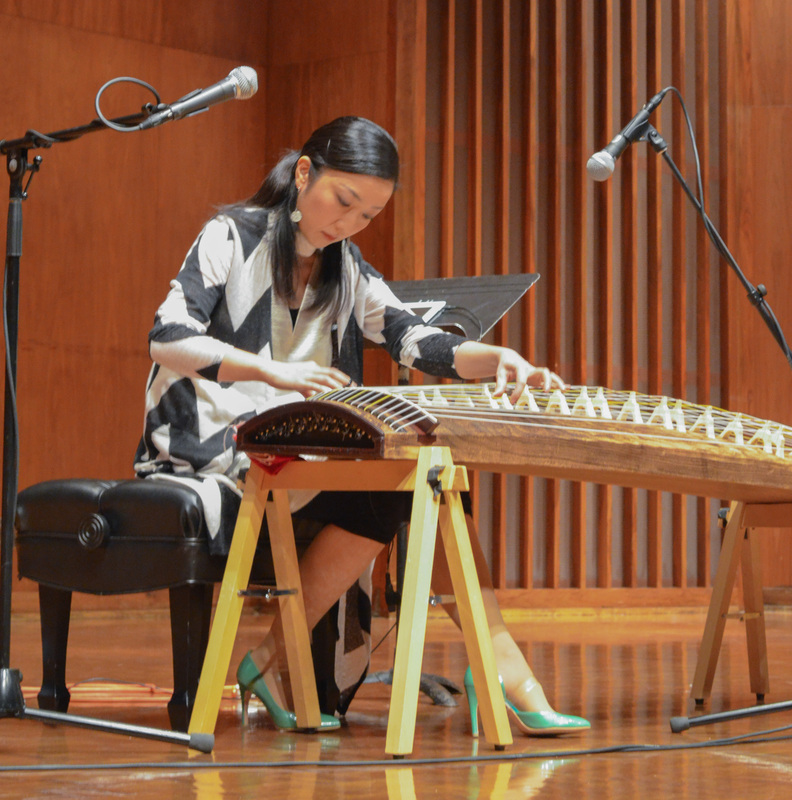 Renowned koto player and composer Yumi Kurosawa performed for the World Music Concert Series on Monday, Jan. 14 at 8 p.m. to a full audience in Harper Hall. Kurosawa composed or arranged all of the pieces on the program except one. Kurosawa talked to the audience about the koto, the national instrument of Japan, which is made of a long, rectangular slab of paulownia wood, many nylon strings and ivory pegs. Kurosawa explained how to tune the koto by moving the several bridges holding up the strings, and she mentioned that it must be re-tuned for every piece. Even so, one can use techniques like pressing down on a string to alter its pitch temporarily. Kurosawa played the koto with ease and virtuosity. In her first piece, “Sakura Cherry Blossom,” Kurosawa used fluttering glissandos and exhibited a large dynamic range. On her right hand, she wore picks on her fingers to help with fast passages while her left hand plucked chords and helped keep the beat. Kurosawa enraptured the audience with her musical skill, with the audience applauding loudly after each piece. One of the more emotional pieces on the program was “Rapture,” a piece divided into three movements to represent past, present and future. Kurosawa explained that she wrote this piece for a collaboration with a short film about the 9/11 attacks. This piece contained mournful rubato sections interspersed with more agitated, quick sections and ended with intense glissandos that filled the recital hall. Kurosawa performed two pieces with electronics, “JB Transfer” and “The harvest moon + Looking up at the sky.” The former piece began with soft rumbles of a sound like thunder that coalesced into a steady homorhythm. The soundscape and the koto became one here, moving together in perfect counterpoint. For the latter piece, Kurosawa told the audience about the two parts of the song: the joyous time of harvest in Japan, and the process of moving forward after the earthquake and tsunami disaster in Japan in 2011. Bubbling electronics and double string trills on the koto seemed to represent hope in this piece, which teemed with life like the humming of insects on a summer night. A crowd favorite was Kurosawa’s arrangement of Vivaldi’s “Four Seasons.” As an introduction, Kurosawa said she first thought that an arrangement of this piece for koto was impossible, since “as you can see, key changes are a nightmare on the koto.” Yet Kurosawa succeeded in her arrangement, and her performance of the work was masterful. Her ability to attain a multitude of tone qualities on her instrument left the audience in awe. At the end of the program, the audience roared with applause, and Kurosawa played an encore: “Summertime,” a standard jazz tune, which everyone loved. With her program, Kurosawa showed that the koto can play a piece in any musical genre. With her performance, Kurosawa displayed an admirable and relatable stage presence in addition to a stellar musical prowess. Everyone in attendance appeared to enjoy another wonderful concert in the World Music Series.